In 2018, L+M and the Lower East Side community gathered to celebrate the opening of the first commercial business within Essex Crossing. The Grand Lo Café is a 2,500 square feet café serving coffee, pastry and lunch, all prepared on site. But the Grand Lo isn’t your typical café. 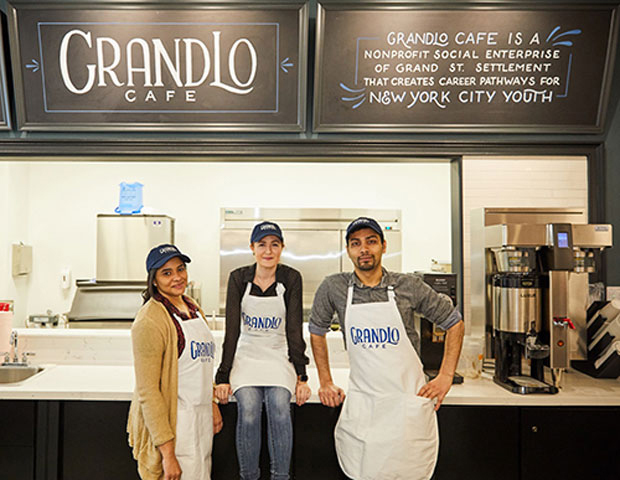 Operated by Grand St. Settlement, the Grand Lo Café is a social enterprise café, the first of its kind for the nonprofit and L+M community partner. The café is a “nosh for profit” and provides not just jobs but career-pathing through skills training to New York City youth who are out of work and out of school. Employees operate the café and event space, with all proceeds going back to the business in support of its mission. Beyond providing hard skills and training, Grand St. Settlement will also leverage its resources to help trainees secure housing, education, healthcare and childcare, integral to their ability to focus on going to school or their career development. L+M and its partners donated the space to Grand St. Settlement and L+M’s construction team, Builders Group, worked closely with the nonprofit to build out the space to their specifications. Located at 178 Broome Street, the café is the first of two commercial businesses to open within Frances Goldin Senior Apartments, a 100% affordable residential building for seniors. The café is open from 7AM-3PM, Monday through Friday, with weekend hours to come.